The industrial needs have promoted a new technology microlubrication and cooling which is proving highly successful in the field of metal cutting and forming machines. Small amounts of lubricant conveyed into a low air stream agains contact area between the tool and the material are proving very effective. 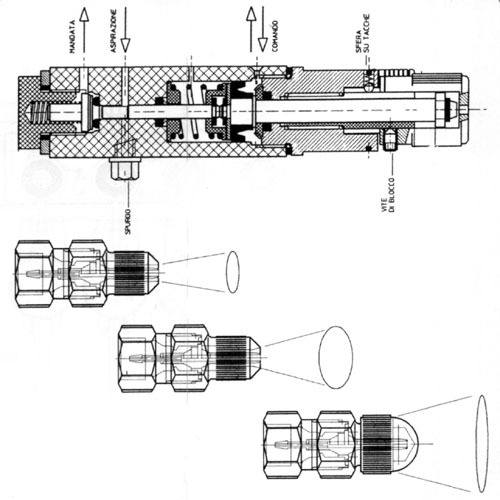 The result is achieved be means of volumetric micro pumps which dispense oil via a capillary tube to a nozzle; a further coaxial tube supplies low air pressure to the nozzle which breaks the two into microparticles. These ttwo element are delivered to the exact contact area without causing pollution. 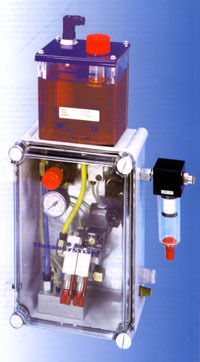 In this way you can combine lubrication in the form of oil with cooling provided be the low pressure compressed air.